As the school year begins to draw to a close and summer vacations start to take shape, keep in mind the Nature Lab (located on the 3rd floor of the State Museum) has a full schedule of upcoming presentations for when Mother Nature throws a wrench in your outdoor plans, be it blistering heatwaves or the occasional monsoonal downpour. 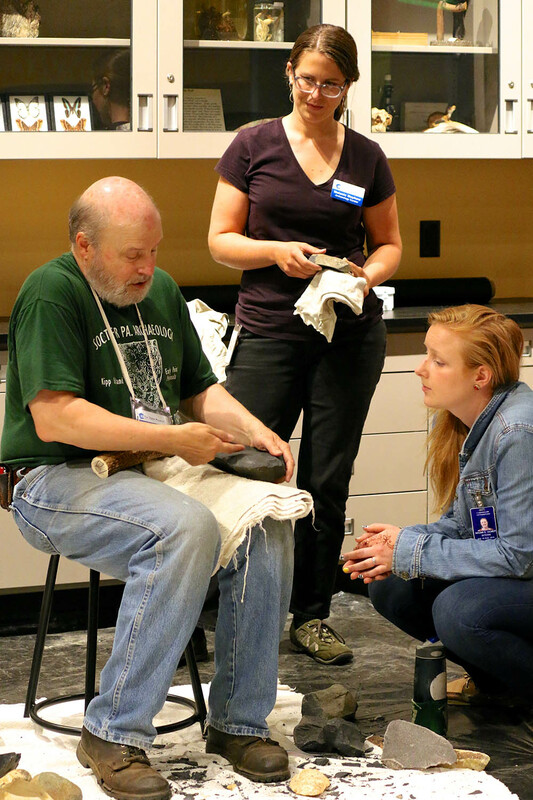 Building on the success and positive feedback from last year’s inaugural Nature Lab Series, the staff of the Section of Archaeology will again host one-hour presentations on a variety of exciting topics from 11am – 12pm every Thursday through the end of July. To accommodate busy summer schedules, each program will be offered at least twice throughout the series. Find the topic that interests you the most, or attend them all! A flint knapping demonstration and an introduction to the methods of cataloging and labeling archaeological collections kicked off our program offerings earlier this month, and we’ll continue with an in-depth look at the different design motifs on Native American pottery found in Pennsylvania as well as an overview of recent archaeological collections submitted to the museum from across the Commonwealth. Click here to visit the State Museum’s Events page for a full listing of upcoming programs. We hope to see you soon in the Nature Lab! A sure sign of summer is high school and college graduations and with this major life changing event often comes the proverbial question of “what are you going to do now”? Many of us are interested in a range of subjects and determining how to hone those interests into a career can be challenging. Volunteering or interning is one way to define those interests and skills and recognize whether there is a sufficient sense of commitment and enthusiasm to develop a career. We have students who volunteer with us, they must be 16 or older, and we welcome interns from the surrounding educational institutions in proximity to Harrisburg. This week TWIPA will feature a blog from one of our two interns this semester from Elizabethtown College. My name is Erin Gregory and I will be graduating from Elizabethtown College this May with degrees in Sociology/Anthropology and English Professional Writing. Afterward, I plan on enrolling in the Museum Communications program at University of the Arts in Philadelphia. But how I went from an English-concentrated course load to my interest in museum work is an interesting story. If you asked 10-year-old me “what do you want to be when you grow up?” I would’ve cheerfully given you answers like a veterinarian, a singer, or an actress. As I got older and was forced to think rationally, all my answers disappeared. Toward the end of high school, I still had no answer, so I applied to undergraduate English programs because I knew I could write. I was half way through my sophomore year of college when I realized I dreaded the thought of a job in copy editing or proof reading. Though I enjoyed my literature classes, I knew I couldn’t make a living off of reading Shakespeare. Luckily, I picked up my second major – Sociology/Anthropology – freshmen year. By junior year, I still couldn’t answer “what do you want to be when you grow up?” (the question matured a little and became “what are you doing after college?”). It took a trip to Iceland to find my answer. My classmates and I visited the National Museum of Iceland in Reykjavik during our trip and I was fascinated. As I wandered from exhibit to exhibit, it dawned on me: museum studies. I could take my passion for anthropology and my writing skills and apply them in a museum environment. After the trip, I contacted my academic adviser and asked about museum internships. She mentioned interning for the Section of Archeology at the State Museum of Pennsylvania and I jumped at the opportunity. I wanted to focus more on the curatorial side of museum work rather than the hands-on archeological work because truthfully, I’m not a fan of getting dirty. So Janet, my mentor, and I decided that I would create an exhibit to highlight the work of one of the museum’s donors, Doris Freyermuth. Doris was an amateur archaeologist who had amassed a very important collection of artifacts from the Delaware Valley. Without having a background in archeology, I knew I would have a rough start. Soon after starting my internship, I learned “rough” was an understatement. What do these numbers and letters mean? How many catalog systems are there? What’s a Riker box? What’s a Vosburg? Sandts Eddy is where? What’s a “Woodland” period? I had all these questions, but luckily, Janet and the rest of the department had all the answers. For the exhibit, I needed to do the following: research Doris’ background in archeology, search the sites she helped excavate, create text that described both Doris and the sites, select some of her artifacts to display, arrange them in chronological order, pin them onto mounts, and map out how they would fit into the exhibit case. I’m sure there were additional steps involved because it took about four months to do all of that. In my defense, I assisted elsewhere in the department, helping staff with other collections. This involved helping to organize collections, package collections, cleaning or reconstructing artifacts, and typing data into their database. My focus was on curator responsibilities, but I wanted to learn everything and thankfully, I was able to do that during my internship. Interning at the museum reinforced my decision to go into the museum field. Though I had a rough start, the staff was very helpful. By experiencing the behind-the-scenes work of an exhibit, I gained knowledge and experience I wouldn’t have obtained anywhere else. This internship has created a foundation not only for my graduate studies but for my future career path. Intern projects are designed to provide training for students and to aid in curation and analysis of our archaeological collections. Our Keystone summer intern will be arriving in a few weeks and will assist in sorting and inventorying of a large collection recently donated by an avocational archaeologist from Lebanon County. This will provide an opportunity to examine artifacts, learn basic tool types and understand the process of inventorying, cataloging and analyzing these materials. If you are interested in interning or are a high school student seeking an opportunity to learn more about archaeology, feel free to contact us for additional information. See our “about us” on the far right side bar.